Since 1953, education spending in Britain has increased by nine times in real terms but levels of numeracy and literacy among school leavers have hardly changed. Today, Britain is the only country in the developed world where literacy and numeracy levels amongst 16 to 24-year-olds are no higher than amongst 55 to 65-year-olds. 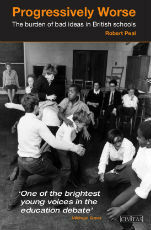 In this historical analysis, Robert Peal argues that this abject record in educating our children cannot be detached from a movement which took hold in British state schools during the 1960s and has been called, with deep inappropriateness, ‘progressive education’. This movement is based upon a romantic view of the child. It believes that children are both innately well-behaved and natural learners, who should be freed from the guidance and direct instruction of the teacher. Michael Gove has courted controversy by attacking progressive education in his speeches. Many accuse him of creating a straw man caricature, which implicates today’s schools in a movement which actually died out in the 1970s. If only this were the case. Since the 1970s, the principles of progressive education have endured, and are now woven into the fabric of state education. Teacher training, local authorities and schools inspectors all signed up to this idealistic, but damaging, belief. Relevance, freedom, active learning, skills and self-esteem have become the unquestionable pillars of this education orthodoxy. Rigour, hard work, knowledge, discipline and competition are deemed pejorative terms. However, there is finally reason for hope. Half-a-century on from its arrival, progressive education is under attack on multiple fronts. Empirical data is laying bare its lack of success and cognitive science is demonstrating its fundamental misconception about how children learn. At long last, government reforms are freeing schools to break away from the thoughtworld of the education establishment. If Britain is to have a world-class education system in the twenty-first century, abandoning the burden of bad ideas it has inherited from the twentieth is the surest route to success. Robert Peal is a history teacher and education research fellow at the think-tank Civitas. He taught for two years at an inner-city secondary school in Birmingham through Teach First and will be returning to the classroom in September 2014 to teach at a free school. He is a regular contributor to Standpoint magazine and keeps a blog on education. Until recently, he wrote under the pseudonym Matthew Hunter, described by Michael Gove as ‘one of the brightest young voices in the education debate’. Robert graduated in 2010 with a starred first in history from Sidney Sussex College, Cambridge and gained a Thouron Scholarship to the University of Pennsylvania. He lived in West Philadelphia for a year, before moving to the West Midlands. He now lives in London.